Inspired by Sudoku, developer Nigel Hanbury created the next generation of puzzles for the iPhone and iPod Touch with the release of his Sevens - a challengingly simple puzzle game to make you lose track of time. The object of the game is similar to Sudoku. You are required to fill in the numbers one through seven on a grid, so that each row and column has all the numbers without any repeating. So far so simple. It's Sudoku straight up, but it's served the Nigel Hanbury way, with a compelling twist. Sevens also features color groups that are randomly scattered on the grid - seven color groups each with seven buttons. And this is where the game gets trickier. Apart from having to fill in each row and column to have all the numbers one through seven, you also have to match the different colors on the grid to have those magic numbers only once. 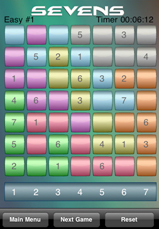 So the game is complete when all the numbers one through seven are present only once on a column, row and color group. You're also running against time, so plan your moves ahead. To insert a number in a cell, simply tap the cell and then choose the number you wish to insert there from the bottom of the game screen. The game features three game levels for you to work with - Easy, Intermediate and Professional. While the color groups ads an extra difficulty to the game, I argue that it is actually a helping hand from the developer. Having to match numbers with colors as well as columns and rows, is just another hint at where to place and where not to place any given number. Sure enough, having to number colors as well does give you an extra angle to look for in the game, but once you get the hang of it, these colors are a life saver. With Sevens, you're dealing with a pretty slick game of Sudoku with an exceptional twist that can simply add to the fun. The graphics are plain and the sounds non-existent, but this is a good thing as well. This lack of sounds and the minimalistic graphics let you focus your energy on solving each game as fast as possible. Sevens is available in the App Store at the price of $2,99 which is a bargain if you're looking to spend a couple of bucks on good fun. The app does indeed lack a lite version for the iPhone and iPod Touch, but perhaps it is not needed as the rules of the game are so similar to Sudoku, that a lite version would simply ruin the fun of the full-sized game. What do you think of Sevens ? Scroll down for our comment section and let us know!